This fast-paced murder mystery grabs readers early in the story. Filled with suspense throughout, this is a book you will likely read nonstop. 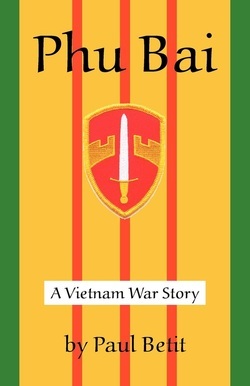 I finished reading Phu Bai: A Vietnam War Story in one night. Afterward I lay staring at the ceiling with a question: What makes it so good? It was an intriguing question, especially for a reviewer whose favorite books are not whodunit types. What I concluded is that Phu Bai succeeds primarily because of its setting: A forward intelligence-gathering post in North Vietnam in 1966. Certainly the plot is interesting. A young soldier is found dead in a bunker so secure that his death cannot be blamed on Viet Cong. Two Army investigators are called to investigate the murder. One is crusty old Chief Warrant Officer Charles Van Dyck (nickname VD) who's been in the service since the closing days of World War II. His partner - the main character in the novel - is a young adventurer named John Murphy. As the two hunt for their killer, enemy mortar attacks pound the listening post. Snipers pick off unwary soldiers. Pilots flying supply planes maneuver boldly to avoid enemy fire. Every serviceman knows he may not make it home. While most Vietnam War novels deal with moral questions about the war, author Paul Betit leaves that question at rest. The war is this novel's backdrop. And a tough, gritty scene it is. Like Lardner, Betit is a sportswriter. He's covered sports for 30 years for the Portland Press Herald/Maine Sunday Telegram. He's also a Vietnam veteran who served as a radio intercept analyst at Phu Bai in 1966-'67. In rank he was a corporal. This is the first novel for Betit, who self-published Phu Bai. A Maine native, he grew up in Augusta and lives in Brunswick. Betit's story line takes lots of interesting turns. Shortly after opening their investigation, VD and Murphy find that the dead man, John Merrill, owed a sizable gambling debt to a young soldier who visited the victim just before his death. Circumstantial evidence points to the GI named Lowe, who is eventually arrested by the duo. But Murphy's intuition raises doubts. The suspect looks like he belongs in a high school homeroom. He cries often and worries about his mother. Still, a mountain of circumstantial evidence forces Murphy and Van Dyck to arrest Lowe. They fly him out of Phu Bai in handcuffs, only to encounter several bizarre events. A second man is murdered, with more tragedy to come. Phu Bai may not appeal to women readers. There isn't one female character in the novel, except for Michelle back in the States. Her only role is mailing a “Dear John” letter to Murphy. Her letter is a distraction that affects the murder investigation. But that's a small criticism of Betit's novel, which centers on a conflict fought by men. Many readers are bound to enjoy this book for its rapid-fire plot and near-cinematic view of the Vietnam War. - Lloyd Ferriss is a free-lance writer and photographer who lives in Richmond.